People who worry and whose minds appear to be constantly on-duty find it helpful to set a regular time for being off-duty or worry free zones. Over time, the worry free zones become longer and more frequent as you progress towards overcoming your worry. Identify any existing worry free zones, or times when you already seem not to worry so much. It may be at a particular time of day, certain places or when doing certain activities. Build on these times so that they become established worry free zones, when you agree not to worry during these times. You might include activities which require greater concentration, relaxation techniques or mindful activity. Agree not to worry during these times. When a worrying thought comes to mind, notice the urge to worry, then tell yourself "I don't need to worry about this now, because I can worry about it later". Over time, these periods of off-duty or worry free zones can be extended in length and/or frequency, and you will become more used to not worrying and it becomes much easier. You will take more control of the worry and discover that you don't have to worry. This seems to work in reverse of a worry free zone. When we postpone our worry, we set a time dedicated to worrying, later in the day. 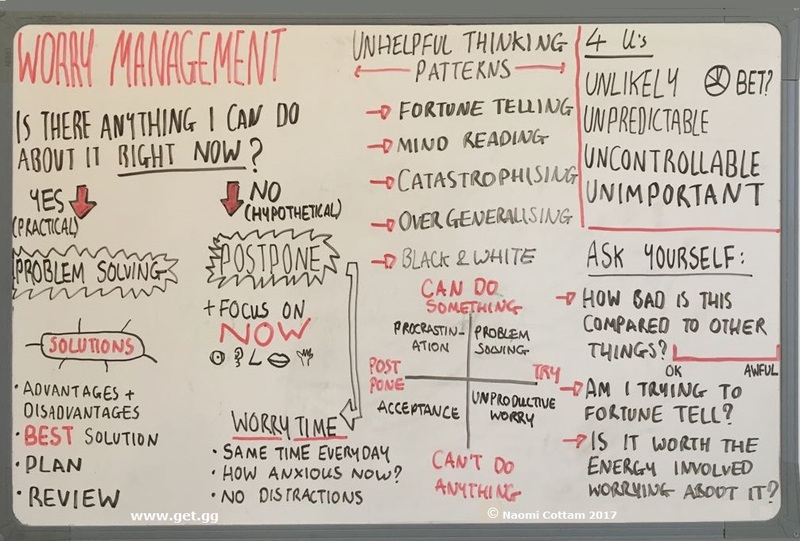 In this situation, the aim is to notice the worrying thoughts during the day, then tell yourself "I'll not worry about that now, as I can worry about it later", then return your focus of attention to what you were doing, or do something else. You may want to carry a note book and write down each worry as it happens, or make a note on your phone. Agree the worry time: time, length of time, and place. During the worry time - only worry about those worries that are still a concern. Dismiss other worries, or postpone less urgent worries to the next time. 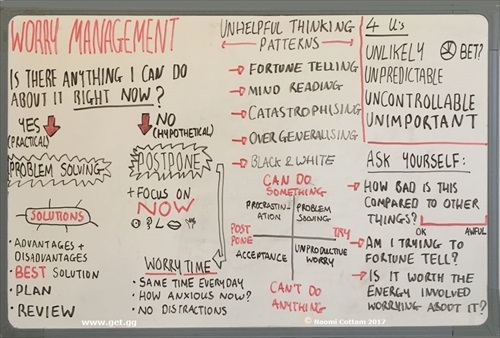 The aim of setting a worry time is that you are learning not to react to worrying thoughts for the rest of the day, and you are taking control over the usual urge to worry. You will find this easier over time until you feel you can control the worry, or not have to worry at all.